Created on farmland outside of Columbus, Ohio, Camp Chase began as a training facility preparing Ohio volunteers for the battlefronts of the Civil War. As Union victories led to increased numbers of Confederate prisoners, Camp Chase expanded operations to include the incarceration of thousands of Confederate enlisted men. More than 2,000 Confederate soldiers died at the camp, victims of malnutrition, exposure, and disease. 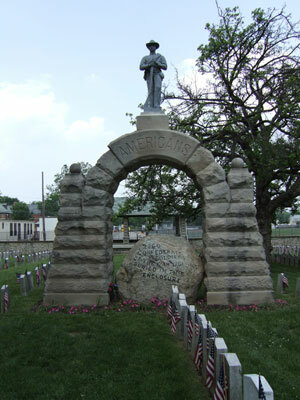 In addition to the many rows of peaked white marble headstones, two memorials commemorate the men who died at the camp. In June 1861, the U.S. government opened Camp Chase near Columbus. The camp replaced a smaller facility hastily set up in Columbus’ city park. Named after Secretary of the Treasury Salmon P. Chase, the camp trained Ohio volunteers for service in the Union army. Shortly after it opened, the camp received its first prisoner of war. Five months later, the camp held nearly 300 prisoners, most of them civilian political prisoners from Kentucky and Virginia. In February 1862, Ulysses S. Grant captured the Confederate stronghold of Fort Donelson in Tennessee, and with it 15,000 Confederate soldiers. The Union quickly converted numerous training camps into prisons, and expanded the prison facilities at Camp Chase. The camp received 800 prisoners after Grant’s victory at Fort Donelson. Both sides operated under a prisoner exchange agreement from September 1862 through the summer of 1863, resulting in relatively low numbers of prisoners at Camp Chase and other prisons. After the exchange program deteriorated, the prison population at Camp Chase grew to more than 2,000 in 1863. By 1864, the prison population expanded to 8,000, well more than the facility was designed to handle. As the prison population exploded, living conditions rapidly deteriorated. Diseases, such as smallpox, typhus, and pneumonia, ran rampant in the camp’s unsanitary, crowded barracks. Prisoners also suffered from malnutrition and exposure during the harsh winters. By the end of the war and the camp’s closure in July 1865, more than 26,000 Confederate prisoners passed through Camp Chase’s gates. Of these soldiers, nearly eight percent died while incarcerated. The military initially interred the dead in Columbus’ city cemetery, but in 1863, it established a cemetery at the camp’s location. After the Civil War, the U.S. government closed the camp and dismantled the prison barracks and other buildings. The government continued to lease the cemetery property, and finally purchased the two-acre site in 1879. The cemetery fell into disrepair, receiving little funding for maintenance until after 1886 when Congress appropriated some money to erect a stone wall around the cemetery. In 1906, the Federal Commission for Marking the Graves of Confederate Dead began the research needed to mark the graves of the men buried in the Camp Chase Confederate Cemetery. The old wooden headboards had long since deteriorated. White marble headstones began arriving in 1908 with the last ones set in 1910. Other improvements to the cemetery included iron fencing placed atop the stone wall to protect the cemetery from trespassers and a set of iron gates at the entrance. Later, to accommodate the memorial ceremonies held on site, a covered rostrum was constructed. With the exception of Memorial Day and Confederate Decoration Day, Camp Chase Confederate Cemetery remained closed to the public. It finally opened year-round in the 1980s. Today, this roughly two-acre cemetery is the only reminder of the original Camp Chase facility. Beyond the cemetery’s walls are residential neighborhoods, a baseball field, and retail stores. The Camp Chase site was listed in the National Register of Historic Places in 1973. Camp Chase Confederate Cemetery is located at 2900 Sullivan Ave. in Columbus, OH. The cemetery is open for visitation daily from sunrise to sunset. Dayton National Cemetery oversees the cemetery; its administrative office is open Monday to Friday from 8:00am to 4:30pm. The office is closed on all Federal holidays except for Memorial Day. For more information about the Confederate cemetery, please contact the national cemetery office at 937-262-2115, or see the Department of Veterans Affairs website. While visiting, be mindful that our national and Confederate cemeteries are hallowed ground, and be respectful to all of our nation’s fallen soldiers and their families. Additional cemetery policies may be posted on site. The Camp Chase site was listed in the National Register of Historic Places in 1973. Click here for the National Register of Historic Places registration file: text and photos. 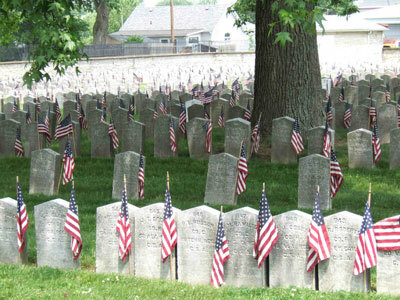 The cemetery is featured in the online lesson plan Not to Be Forgotten: Camp Chase Confederate Cemetery, which delves into the history of the Union’s largest prisoner of war camp and its burial ground. The lesson plan is produced by the National Park Service’s Teaching with Historic Places program, which offers a series of online classroom-ready lesson plans on registered historic places. To learn more, visit the Teaching with Historic Places home page. Camp Chase Confederate Cemetery was photographed to the standards established by the National Park Service’s Historic American Landscapes Survey.